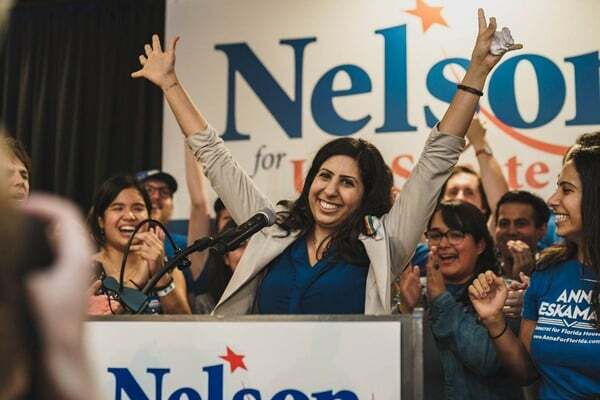 Anna Eskamani and Anna Kaplan (Monahemi) were elected to Florida House and New York Senate Tuesday, becoming the first Iranian-Americans to win such seats in the two states. Eskamani ran against Republican Stockton Reeves to replace Rep. Mike Miller in what was described as a hotly-contested race. District 47 includes Orlando and Winter Park. “Together we’ve made history, in not only challenging the status quo and flipping a competitive state house seat– but in also electing the first Iranian-American to any public office in Florida,” Eskamani wrote in an email announcement after winning the election. She is a UCF graduate and Orlando native who served as senior director of public affairs and communications at Planned Parenthood of Southwest and Central Florida for six years before filing to run for a seat in the Florida House. Anna Kaplan (D-Great Neck) also defeated state Sen. Elaine Phillips (R-Flower Hill) in a tight race for state Senate District 7, unseating the one-term state Senator to help cede full state government control to Democrats. With 291 of 292 polling precincts counted, Kaplan earned 58,118 votes to Phillips’ 48,180 – an unusually high turnout – with victory margin of 54.66 to 45.32 percent. Kaplan, an Iranian-American, was born in Tabriz, Iran. She immigrated following the 1979 Revolution in Iran. Millions of Americans headed to the polls on Election Day. Results show that US Democrats have taken control of the House of Representatives for the first time in eight years, a crucial victory that spells trouble for President Donald Trump in the second half of his first term in office. Initial results of the frenzied midterm elections projected Democrats as the next majority party in the House. Democrats will now have the opportunity to frustrate Trump’s legislative plans and ramp up their “obstructionist” approach, as the president would like to call it.